It goes back to one of our first articles in the Latin Tongue series: El Guayaquil. You may remember that we went to the corner of Lake St and Bloomington Ave without a plan, not realizing that there were at least a dozen options. While there, we passed a store front without an obvious name that had a bunch of pictures of Mexican food in the window, but otherwise, nothing else to identify the place. It was very small and unassuming and has had us in a state of wonder ever since. We could wait no longer. The pictures of Tlacoyo, Huarache and Popusas were calling...and we had our suspicions that the taqueria was connected to La Poblanita, a local tortilleria. Upon entering, we were no closer to discovering the real identity of the place. It was certainly part of La Poblanita as was obvious due to the huge tortilla making machine and the small grocery/meat counter next door flush with La Poblanita products. What we did discover, was about 6 tables and two hard working ladies who were ready to serve and friendly (and masters with a tortilla press.) The menu was similar to those that we have encountered from Mexico City and the surrounding area. It was full of masa corn dishes such as the above mentioned huaraches, sopes and popusas, not to mention some good looking tamales. 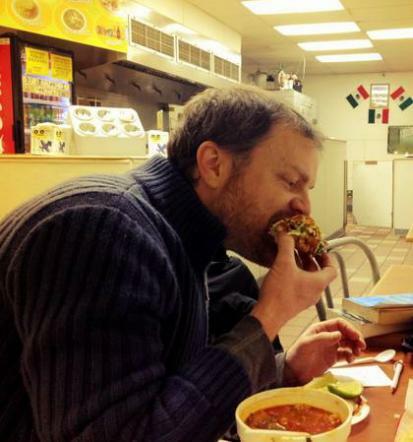 There were also some tempting guisados (stews) which seem to be a trademark of that region. We found an easy answer to our "what the heck do we get" dillemma in a combo plate that had a huarache, tlacoyo, taco, and a sope (The workers highly recommended the Tlacoyo.) From there we ordered some tamales and tacos as per our standing agreement and looked for one more specialty dish. We landed on something completely new and strange (big surprise, huh?) called Manitas de puerco. Yup, Pig's feet. Upon ordering, the ladies threw the meat on the grill and then went to work shaping and pressing the corn cakes for many of our items. There is something exciting knowing that you are getting freshly made masa corn cakes, especially (as we found out later) when they are made from whole corn kernels, not just meal. See, the ladies were so kind that they wanted to show us the operation in the back room. It consisted of a soaking tank for the corn kernels, a grinder where they grind the wet, soaked corn into two grades of coarseness and finally, the production tortilla machine, a huge conveyer like beast that shapes, cuts and cooks the tortillas. Now how many places can offer you that?! While waiting for our food, we also had time to study our receipts and noticed something interesting. A name. Not just the La Poblanita name, but one finally identifying this place as: Taqueria Morales. Mystery solved...sort of. tacos y tamalThe tamales were our first taste and I must say that we were pleased. They only had pork that day and it is unclear to me still whether that is true every day. Nonetheless, let me just say that they were excellent. The masa corn had a nice thick crumb, but was still moist and creamy like a perfectly made cornbread. Despite a generous serving of pork, they held together. It also had a great spice profile, something like clove. As for the pork, it had some rich fatty parts and was in an absolutely wonderful, bright red and slightly spicy adobo sauce. Top notch! 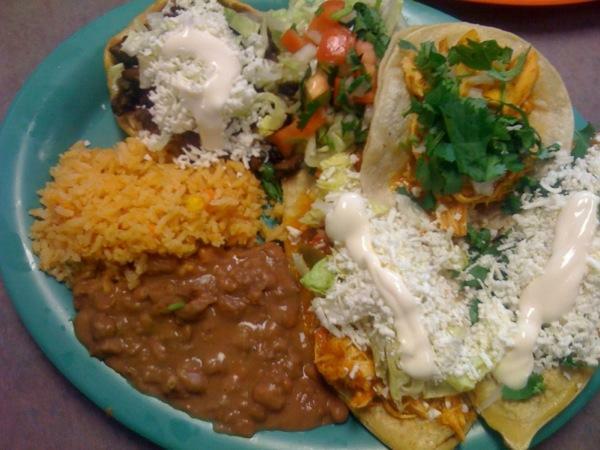 The tacos and platters showed up and Charles went to work on the Pig's feet, which were doused in a salsa verde and served with rice and beans. He seemed pleased, to say the least and beckoned me to take a bite. Now, I've had pig's feet in the form of ham hocks used to season southern dishes such as pork and beans or a good pot of greens. But to take them on whole was foreign to me and I must admit that I was a little daunted. I snagged a piece of nice dark meat with plenty of salsa verde. I was blown away. This might be the best salsa verde since I lived in Santa Fe. It was a perfect balance of sour and savory, possibly due to the overwhelming pork presence. Whatever was going on, it was outstanding. And the pork was rich and buttery. As I would learn, Manitas de puerco is a varied dish which consists of that buttery, dark meat but also has plenty of fat and gristle or cartiladge which you eat...or don't. In the end, this dish was a great (even the beans were more tasty than expected) experience with some amazing flavors and would we order it again? Charles gave a resounding yes, while I gave a yes, but only after I try some of the other salsa verde based dishes first, such as the ribs. The combo plate was a good decision. It allowed us to try everything made with the masa corn, except for the popusa. The Tlacoyo was our favorite by far. Often, these are made with tortillas, which are filled with refried beans then fired on the grill. 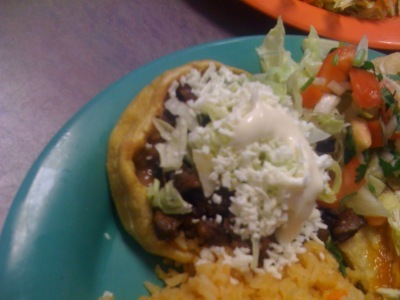 Ours was made with a thin pressed masa cake and filled with refried beans, then topped with cheese, sour cream and onions. It was simple and excellent. tlacoyo y huaracheTheir huarache is a bit thicker version of the Tlacoyo, but you add meat (we had carne asada) and lettuce. 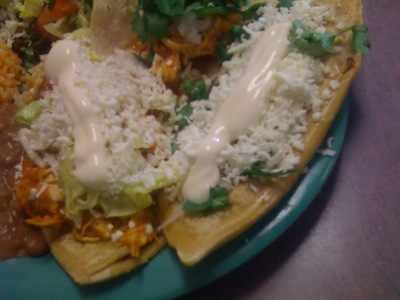 It was also very good, but for no reason in particular that I could identify, not quite as good as the Tlacoyo. The sopes were excellent. I have the bad habit of comparing every sope I order to my favorite, which are from Taco Taxi, just a block away. I have never found one to compare. Well, here at Taqueria Morales, they are a close second. They are obviously freshly fried and have that great combo of crispy/chewy and once you add some of the homemade salsas that are on your table, they are in the upper classes. We finally come to the tacos. 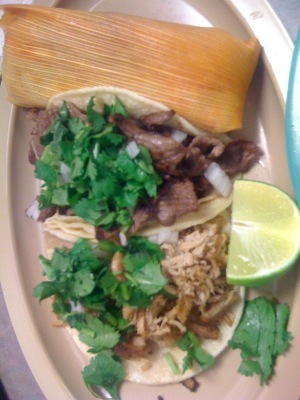 We had three: one chicken, one cecina and one carnitas. First off, the tortillas were obviously made in house (although not to order...that would be madness.) Second the meats were generous in amount and all very good. The chicken was the type that is a bit like a stew, with peppers and onions and a sort of orange sauce that in our experience is a blend of carrots, peppers and other vegetables. It was very, very tasty. The cecina was very tender, as was the carne asada served in the combo. Tender steak has not often been the case in our Latin travels. In the end, we thought the cecina was a bit better than the asada, although both were good. Finally the carnitas is the type that resembles a pulled pork that has been slow cooked until very tender and then given a brief grill treatment to give it just a hint of fried meat. What with the tour of the kitchen, the kind service and the food which was excellent across the board, it was impossible not to be pleased. Funny how such a humble place so excelled...we just keep finding that. We will certainly be back and I know what I'm having. Certainly, I will order some tamales and a Tlacoyo. 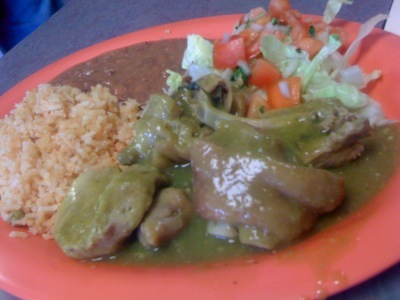 As mentioned above, anything with that salsa verde seems like a fantastic idea. Finally, I noticed a couple of mole dishes on the menu that I will certainly be trying. One was a pipian mole (pumpkin seed) and the other was the more traditional mole poblano. I can't wait! Surprisingly affordable...all that food above was $26. Surprise: The whole tortilla making process was a surprise to us, the tortilla press on the counter, the grocery and meat. Language: Not as fluent in English as some perhaps, but it was certainly not a problem. Lawrence Black is a writer and editor at Simple, Good and Tasty. He can be reached at lawrence@simplegoodandtasty.com. He has lately been consuming large quantities of hot peppers, so it may be advisable to stay at least three feet away...unless you are cold.